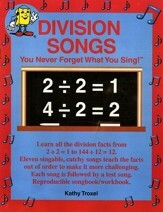 Memorization is always easier with music! Discover how music can positively impact the retention of knowledge with catchy, educational tunes from Audio Memory. 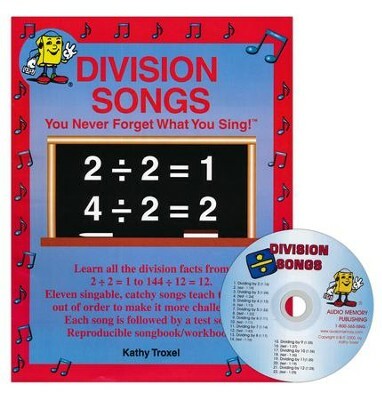 Division Songs teaches kids division facts from 2/2 to 144/12. 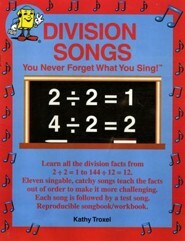 Each song is repeated with a pause during which students may answer the question themselves; a sing-along test is given after each song. Facts are taught in sets (2's, 3's, etc.) but are sung out of order for more challenge. 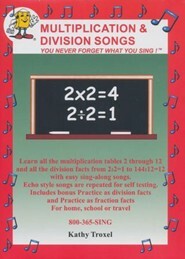 The accompanying workbook gives students opportunities to practice writing and solving the drills they're learning from the CD. It includes all facts, one column with answers and a second column without answers, as well as practice drills. Ideally, students listen and learn the facts with the music, then sing along while pointing to the facts with answers; they can then take the audio test and say the answer, first looking at the written answers and afterwards without the written answers. Finally, they write in their own answers and progress to the next set of facts. 22 Tracks (including tests) on CD. Pages are reproducible for student use only. 15 pages, magazine-style binding. Grades 3 & up. 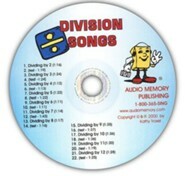 I'm the author/artist and I want to review Audio Memory Division Songs Workbook & CD Set.